For customers who have more specific holiday requirements, we can offer bespoke horse riding holidays, designed around your individual riding requirements. This bespoke service can encompass one ride for one rider during the week, to a full week of trail riding for the whole party. Offering you complete flexibility for all riders. Our friendly instructor – who is BHS trained – can offer you private or small group lessons, or tuitional hacks so you can learn whilst riding out. For the more serious rider, who enjoys longer rides of up to 7 hours (with breaks), we can offer a range of off-road trails to take you around the Moor, over tors, through water and woodland. Some trails even go as far as the North Cornwall Coast via the Camel Trail, enjoying some of the most beautiful countryside in Europe. Or you may be an experienced rider, who prefers to improve your riding in open spaces and would benefit from a trail riding experience to build confidence. For less experienced riders, a week-long confidence-building package could end with a trail ride at the end of the week. A bespoke horse riding holiday package is designed to accommodate your individual requirements whilst you are on holiday at Hallagenna. 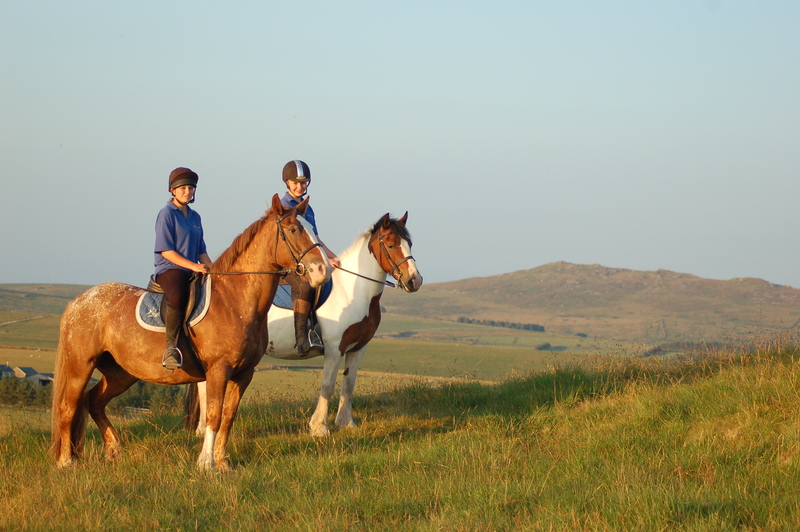 Out of the main school holidays, we can also offer bespoke riding holidays on a Bed and Breakfast basis, with a Full English or Continental breakfast prepared in your cottage. We can also provide Picnic Lunches and three course evening meals either in your cottage or transfers to a nearby pub. For a sample of a fully catered week-long itinerary, please click here. We can also offer Short Breaks out of school holidays – mid-week or weekend, self-catering or catered – it’s up to you! Please call us to discuss your requirements on 01208 851500. Day 1: Arrival and introduction to your self-catering accommodation, our horses and the stables. Day 2: Assessment lesson in our all-weather manege, with an introductory ride on the the Moor. The rest of the days is yours, to help out with the horses, enjoy some local sightseeing or activities. Day 3: Morning Lesson followed by a tuition hack on Bodmin Moor, visiting Alex Tor and the surrounding Moorland. Day 4: Morning Lesson followed by a longer tuitional hack to Roughtor on the Moor. Day 5: Morning Lesson followed by a 2 hour tuitional hack to the Trippett Stones and King Arthur’s Hall, high up on the Moor. Day 7: Morning Lesson followed by a 3 -4 hour tuitional hack, taking in the River Camel, Jubilee Rock, through Pendrift Downs to the Blisland Inn for a well-earned break and lunch. Returning via Carbaglett and the Trippett Stones. Day 8: Depart – or enjoy another week of off-road riding to further improve your riding ability and discover some more of the beautiful Cornish countryside on longer trail rides. Day 2: Prepare your horse for an assessment lesson with our Instructor, followed by some stable management experience on the Yard. 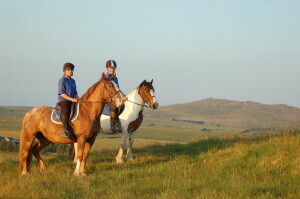 In the afternoon enjoy a hack around Roughtor. Day 3: Prepare your mount for a 3 – 4 hour Rocky Tor Trail, returning to Hallagenna early in the afternoon, with time to relax or explore Cornwall. Day 4: Collect your mount from the field, saddle up, ready for the Woodland Trail, returning 4 hours later with time in the afternoon to relax. Day 5: Enjoy a well-earned line-in, whilst your mount is saddled up, ready for the Blisland Trail, including a pub lunch at the Blisland Inn. We return in the afternoon for time to explore. Day 6: Collect your horse from the field and prepare for the Jamaica Inn trail, stopping off at the famous, haunted pub. Day 7: Join us in the morning for a jumping lesson in the manege, followed by a two hour ride to the Trippett Stones, stopping at the river for a short picnic break. Or join a trail through the Camel valley. Day 8: Depart. Or spend a second week exploring our beautiful Cornish countryside. The above examples are just some of the diverse programmes we are able to offer according to your specific requirements and experience. We shall of course be pleased to make suggestions according to your ability. The advantage of our Bespoke Packages is that they are completely flexible, and can be tailored around riders and non-riders alike when holidaying at Hallagenna. To help us devise the best package possible, please provide us with as much information as possible on your riding abilities and how much riding you would like to do during your stay. We will then forward an outline schedule of riding, according to your requirements, along with the cost per rider. To avoid disappointment, please complete the accommodation booking form (whilst omitting the riding section). We can then reserve the week’s accommodation and add the riding element of the package at a later date. If you have any queries on our bespoke packages, please do not hesitate to contact us on 01208 851500 or email us here.